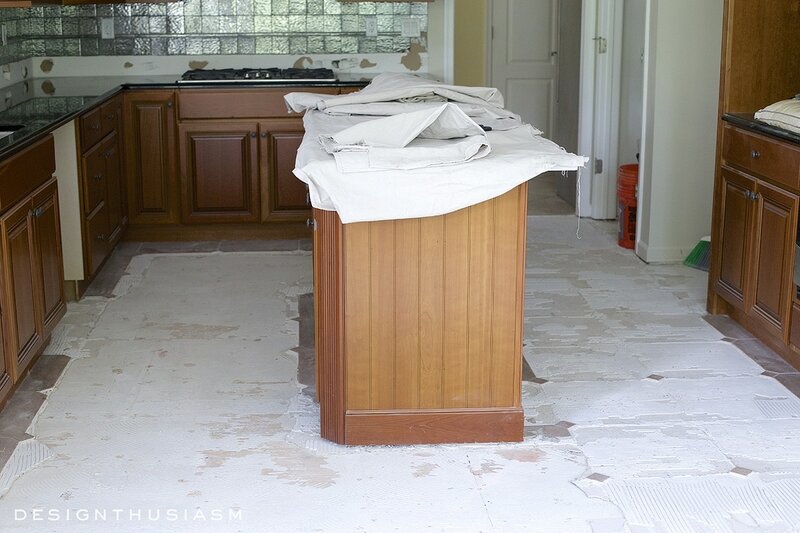 If there’s one thing I most hated about my pre-renovation kitchen, it was the hideous ceramic tile floor. It was dark, dull and lacking in character. I knew I wanted it out, but I really had to think long and hard about what I wanted in its place. 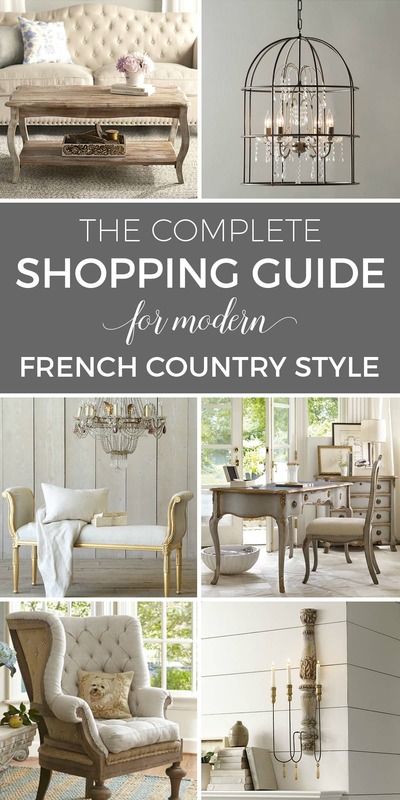 I considered dark stained wood, pale tumbled marble and a faux wood tile floor. I was so sure about every other decision, but this one took a bit of research. I wanted to pick a floor that was not only pretty but that would convey the character I wanted the room to embody. This is week 3 of the One Room Challenge and the week I finally banished that hated floor from my home once and for all. As a reminder of where we started, you can see the photo above. 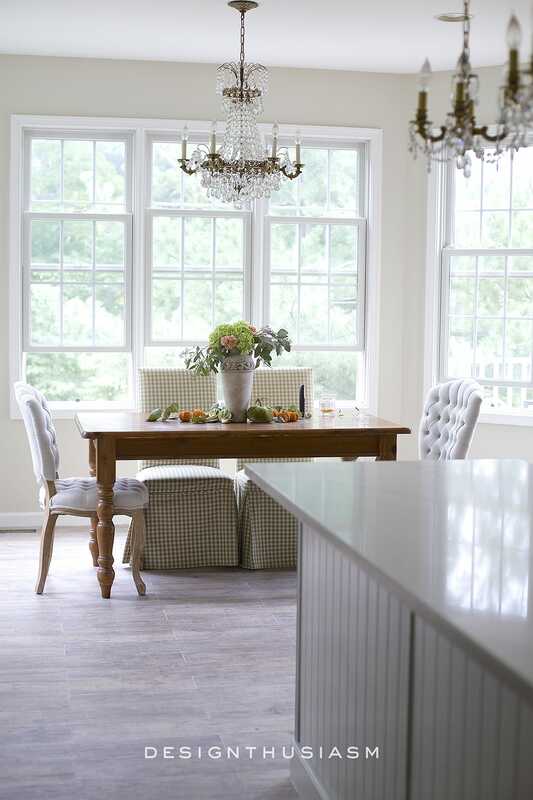 Starting dark and dreary, my vision shown in week one, was to turn this space into a bright white kitchen that worked well with my French country style. Last week we replaced the island counter and this week I turned my attention to the kitchen floor. As anyone who has renovated a kitchen knows, it’s disruptive, disorienting and a complete mess! And this week represented the absolute rock bottom in terms of chaos, displacement and utter inconvenience. Yet I was so delighted to have that floor removed, that I truly enjoyed tromping around amidst the disarray. There was dust everywhere, plastic tarps over the furniture, doors closed and the dining room table littered with items removed from the kitchen. The table was moved out of the breakfast room to make pulling the floor up possible and the coffee maker and toaster were moved to the butler’s pantry. Every time I ate something I was sure I was eating dust. But with every bang and flutter of dust, my floor came closer to the one I dreamt of and the kitchen closer to the one in my vision. From this view above, I could actually begin to picture the fruition of my plan. The tiler removed the existing tile and also added a new sub-floor. Among other inconveniences, I also had to deal with a disconnected dishwasher, which was then crammed into our dust laden den which was already beginning to look like an over-stuffed warehouse. The refrigerator was moved into the front hallway, a position I’ve gotten so used to, that once the floor was done and we moved it back, I continued to find myself walking into the hallway for food. Yet after days of demolition and sub flooring, it was time to start putting the actual new floor down. I can tell you I was downright ecstatic! 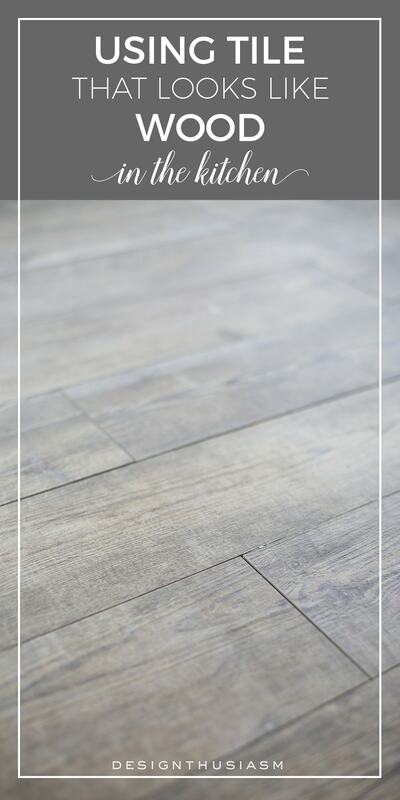 In the end I chose a faux wood tile floor with a distressed grey tinge that gives it an antiqued farmhouse feel. 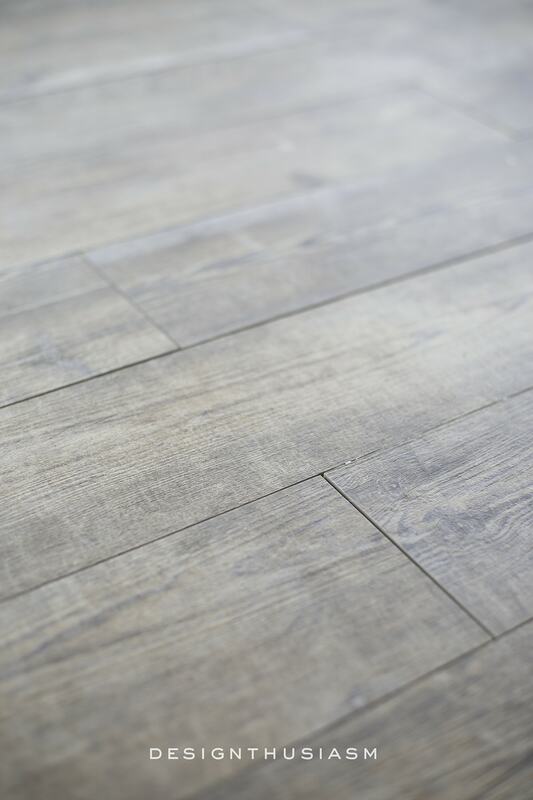 It’s porcelain tile that looks like wood, warmer that the ceramic we had before, lighter in tone and fresher in spirit. Is it possible to have a crush on your floor? I look at this wood grain tile and can’t believe it’s not the real thing. The color is perfect for the wall paint I already had, likely because I always knew this was where I was headed, even if I hadn’t picked the actual porcelain wood tile yet. Next came the grout which had to dry overnight… another day of not walking on the floor. You can already begin to see the lighter look in the breakfast area, although I do intend to add new chairs and the table looks too small now that the space is lighter and airier. The work part of the kitchen still looks dark with my cherry cabinetry and steel grey backsplash, but next week we’ll move forward and get that backsplash spruced up. Hint… it just may involve my favorite marble tile. 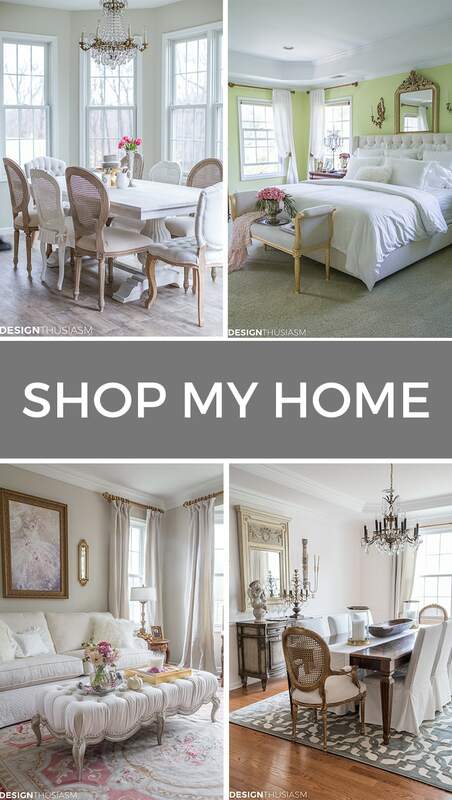 To get the look of our kitchen, click on the items below for direct links to the products. Where actual items were no longer available, I’ve provided similar options. It looks great! We also turned to wood-like tile for a room where putting in real parquet would have been difficult and costly. It’s pretty and practical. Thanks! So far I’m really happy with it. I’m crazy about the look and it’s pretty comfortable to walk on. Thanks for stopping by! 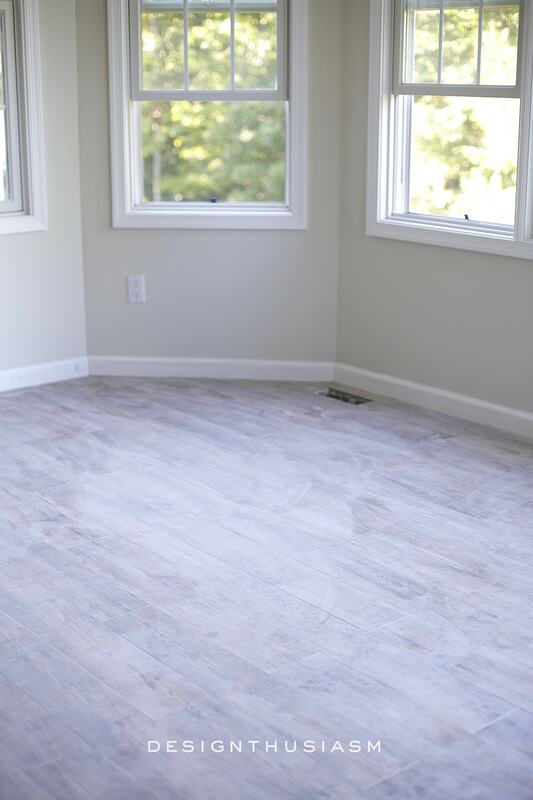 Beautiful floor and goes soo well with the floor 🙂 I love your home Lori ! ooooh i am drooling over those floors! so good! Oh do I know what you are experiencing! 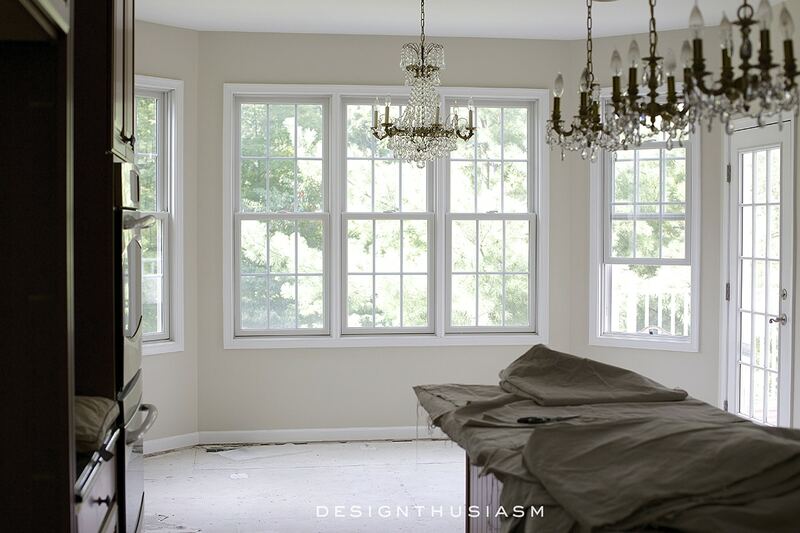 Last year we completed a partial kitchen renovation,and you are right about the dust and chaos. 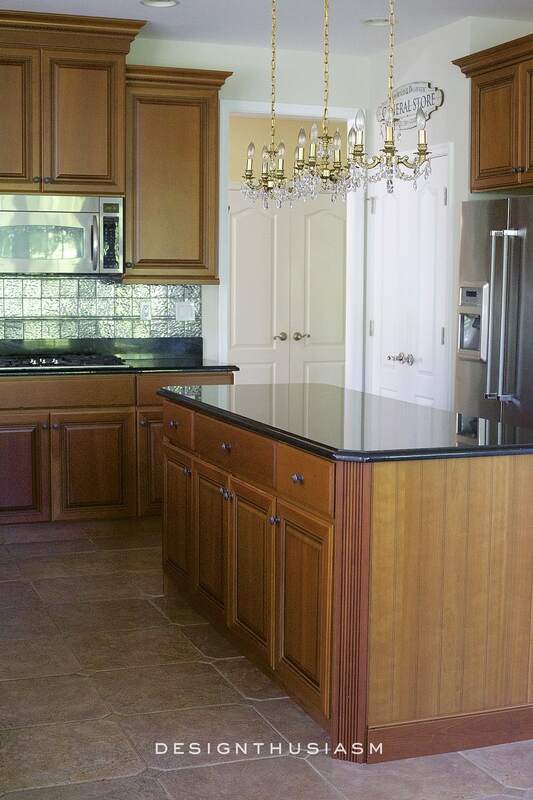 However, as you can already begin to see, it is worth it all to have that kitchen of your dreams. I love your progress thus far,and can’t wait to see the finished product. Patience,patience,as it will pay off. Lory, your floor looks great! 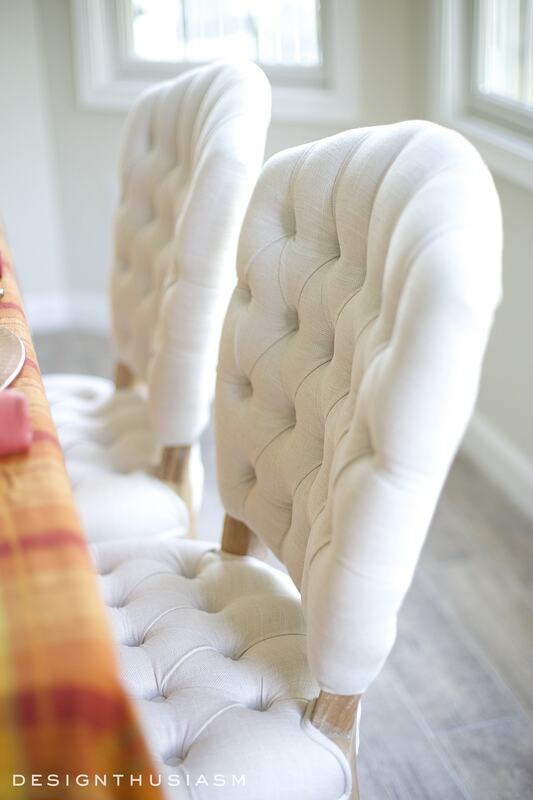 Enjoying the posts on your kitchen makeover! Thanks, Shenita! Much more to come!! Thanks, Cindy, and I agree it looks so much brighter… 🙂 Love the idea of using it in a laundry room!! 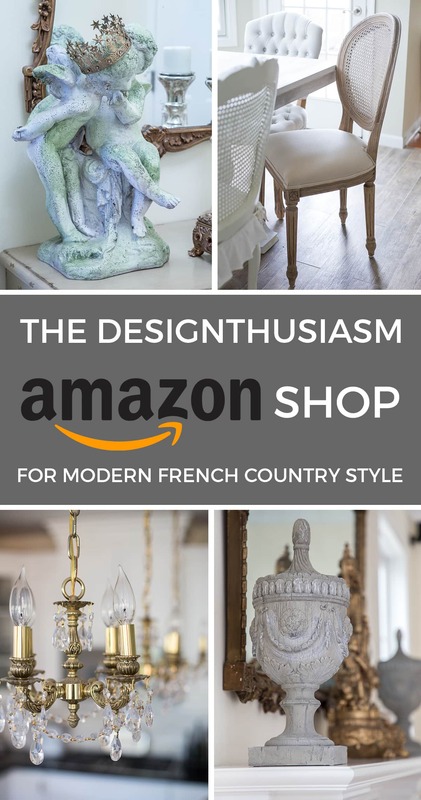 Yes, my vintage chandy was a fun purchase. I do wish it was a bit lower. Thinking about having it rewired so I can lower it a foot. Our ceilings are 9′ so it really is too high (but pretty nonetheless… ;-)). Lory, your new floors are beautiful! You will really enjoy your new kitchen! It’s going to look so nice! Thanks, Mary-Ann! Yes, I hope so. So far I’m very pleased… 🙂 Just ripping out the dreaded floor made me happy!! LOVE LOVE LOVE! Those floors are gorgeous! I can’t wait to see the final reveal! Oh Lory, just love the floor. Don’t you just love the grey tones of flooring nowadays. It seems to blend so well with neutral furnishings. My home just got new flooring last yr. ALL rooms but two, so I feel your pain about out of place furniture, actually out of place everything! I’m looking forward to the changes each week as I know they will be lovely. Lory, I can not believe how much brighter the room already looks!! The flooring is gorgeous. Lory, Wow! 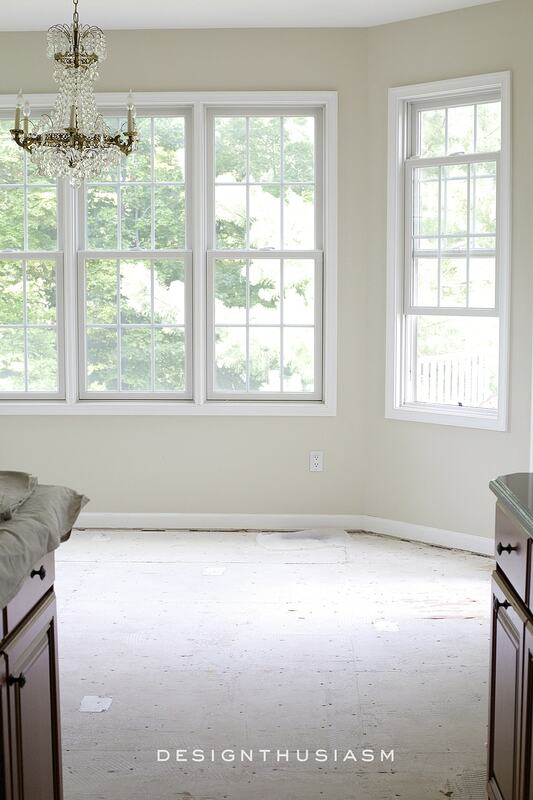 That lighter, brighter gorgeous flooring added square feet! It really opened up the space nicely. I just love renos, the anticipation is so intoxicating, then the climax of the finished look! Everything is going swimmingly so far, can’t wait to follow along to see the rest! Can’t wait to get a place I can do some demo on, living in a rental now, so my reno hands are tied down. Thanks, Cathy!! I agree – the room looks so much larger. My poor little table gets lost in it! Just as well since I wanted a table with more seating anyway, but not sure that will be done in time for the final reveal. Lory, that flooring is amazing!!! Love it! Lory, the new floor really does look amazing! Your breakfast area is so light and airy now and I cannot wait to see the new backsplash! This is such a fun transformation to watch! Enjoy your weekend! Ha ha, thanks Kristin! I was lucky the renovation just happened to coincide with the One Room Challenge… 😉 And since we’re not ripping out the cabinets, I felt more secure with the time line. I have floor and countertop envy. lol We will be moving from PA back to AR in three years when hubby retires, so I’m waiting for the kitchen I really want. Your room reno is looking great! Hi Karen, Sorry for the delayed reply, but I waiting to get you the exact info. It’s Aspen Natural porcelain tile from Ceramica Sant’Agostino. Thank you! 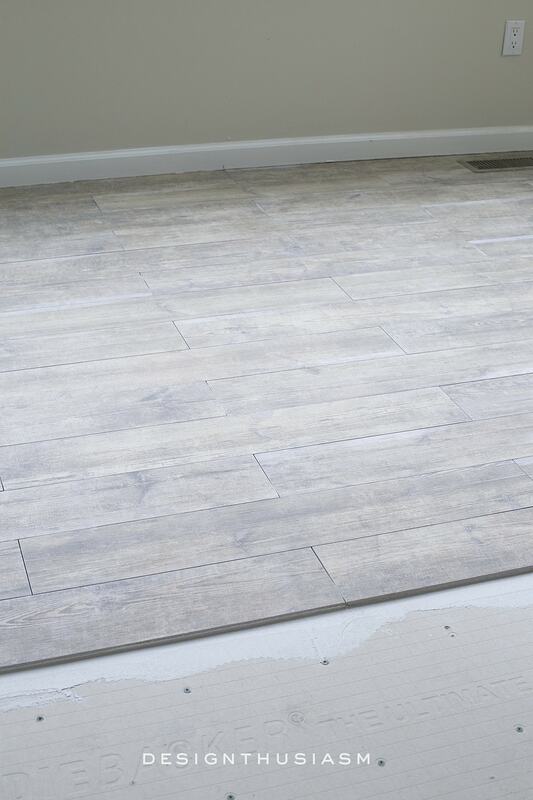 It’s Sant’Agostino Porcelain Tile in Aspen Natural. This article makes we doubly glad we were able to replace kitchen tile flooring before we moved in. Last year we removed tile from our master bath and THAT was stressful enough to live with. 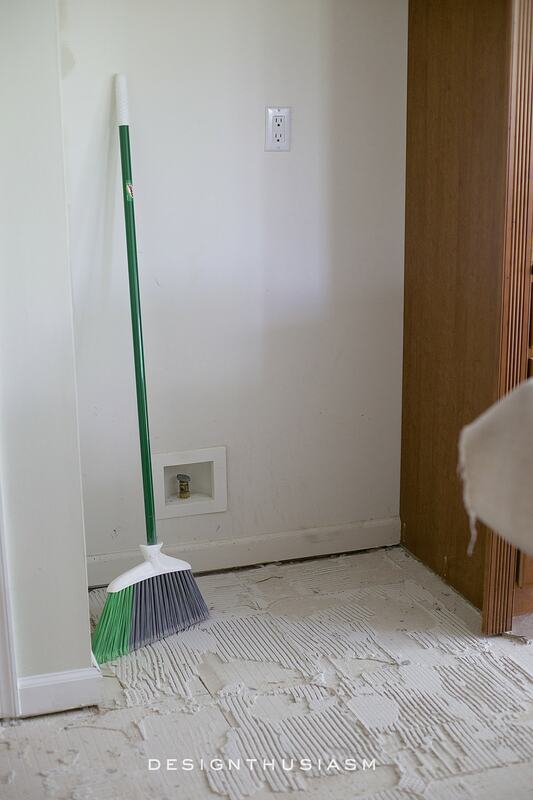 Between tile removal and sheet rock repairs to the walls, the house looked like the Bonneville Salt Flats. It was worth it in the end. BEAUTIFUL JOB Lori!!! I love this floor; there’s a house being built down from us, we went in to scout it out the other day, and wow! 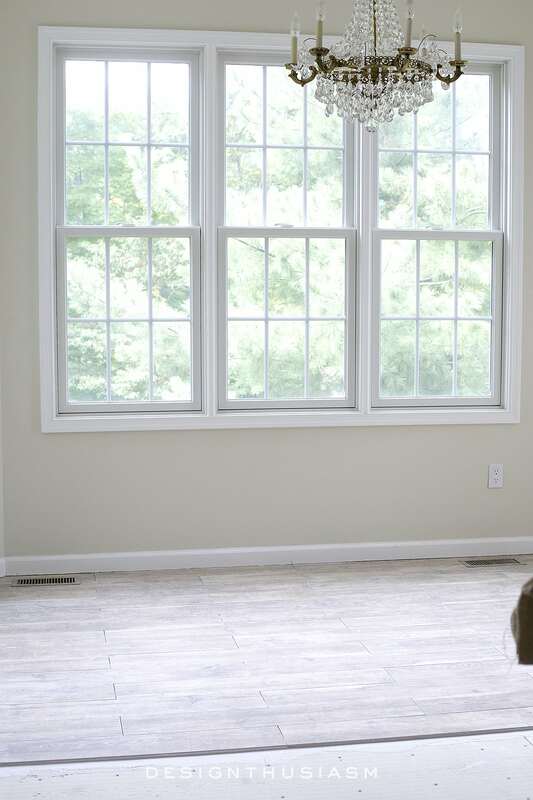 it has the same floor as what you just put down……OMG, it is gorgeous in person, and I fell in love; would love to have in my kitchen (have same builder-boring beige 12×12 tile blocks (no personality)) but husband doesnt want the upheaval in replacement, he cant do anymore, and doesnt want to pay someone else. so, no newbie for me. hope you enjoy!!! 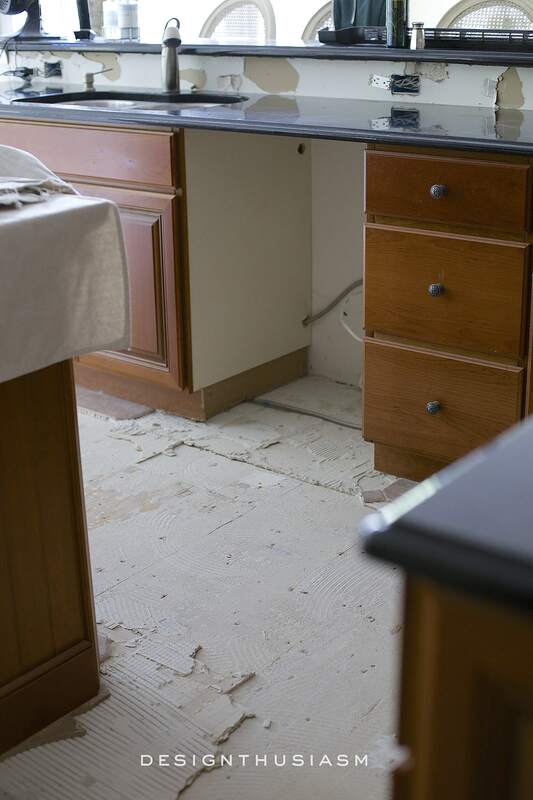 Did your tiles run under your cabinets? I need to replace my tile but it goes under the cabinets and I am not sure how we go about removing the tile without lifting the cabinets. I’d love to have faux wood tile, our floors weren’t the right fit for it… but I wish they were. They really look gorgeous, you must be over the moon! !